Rasmus Lentz, Professor, University of Wisconsin–Madison. Ole Agersnap, PhD Student, Princeton University. Anders Humlum, PhD Student, Princeton University. 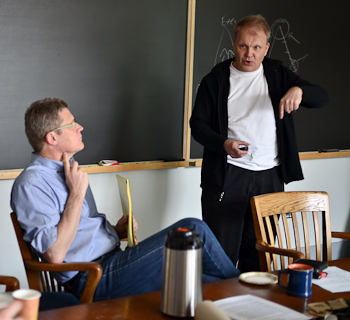 Mikkel Sølvsten, Assistant Professor, University of Wisconsin–Madison. Mathilde Almlund, Postdoc, University of Oxford. Mikael B. Andersen, PhD Student, University of Wisconsin-Madison. Torben G. Andersen, Professor, Kellogg School of Management, Northwestern University. Niels-Hugo Blunch, Professor, Washington and Lee University. Tim Bollerslev, Professor, Duke University. Helle Bunzel, Associate Professor, Iowa State University. Peter Christoffersen, Professor, Rotman School of Management, University of Toronto. Farhang Farazmand, Economics Consultant, Cornerstone Research. Niels Haldrup, Professor, University of Aarhus. Karsten T. Hansen, Professor, Rady School of Management, University of California, San Diego. Peter R. Hansen, Professor, University of North Carolina, Chapel Hill. Nikolaj A. Harmon, Assistant Professor, University of Copenhagen. Esben Hedegaard, Visiting Assistant Professor, W. P. Carey School of Business, Arizona State University. Jonas Hjort, Associate Professor, Columbia Business School. Bo E. Honoré, Professor, Princeton University. Michael Jansson, Professor, University of California, Berkeley. Katarina H. Jensen, PhD Student, University of California, Berkeley. Rasmus Jørgensen, Assistant Professor, University of Copenhagen. Steen L. Jørgensen, Director, World Bank. Adam Jørring, Assistant Professor, Carroll School of Management, Boston College. Henrik J. Kleven, Professor, Princeton University. Dennis Kristensen, Professor, University College London. Christian Lund, PhD Student, Northwestern University. Morten Ø. Nielsen, Professor, Queens University. Mikkel Plagborg-Møller, Assistant Professor, Princeton University. Claus C. Pörtner, Assistant Professor, Albers School of Business and Economics, Seattle University. Ernst Schaumburg, Research Officer, Federal Reserve Bank of New York. Lars Stentoft, Associate Professor, University of Western Ontario. Bent E. Sørensen, Professor, University of Houston. Jesper Riis-Vestergaard Sørensen, PhD Student, University of California, Los Angeles. Michala I. Riis-Vestergaard, PhD Student, Princeton University. Morten Sørensen, Associate Professor, Columbia Business School. Allan Timmermann, Professor, Rady School of Management, University of California, San Diego. Dorthe Verner, Principal Economist, Inter-American Development Bank. Emil Verner, Assistant Professor, MIT Sloan School of Management. Lise Vesterlund, Professor, University of Pittsburgh. Marie-Louise Vierø, Assistant Professor, Queens University. Anette Vissing-Jørgensen, Professor, Haas School of Business, University of California, Berkeley. Birger Wernerfelt, Professor, MIT Sloan School of Management. Nils Wernerfelt, PhD Student, Massachusetts Institute of Technology. Svend Hylleberg, Professor, Aarhus University.